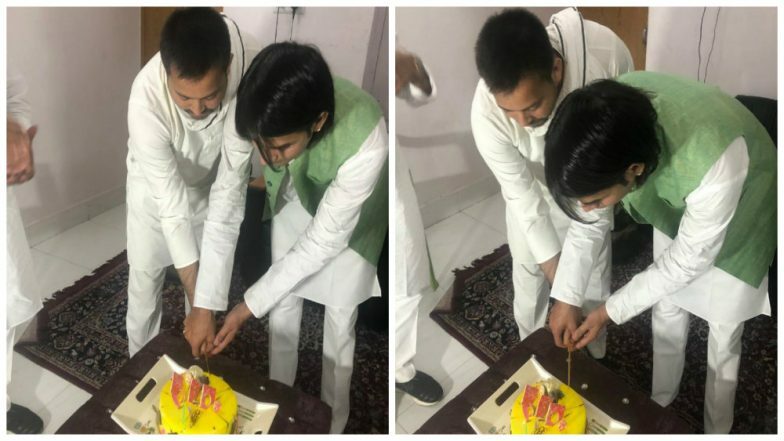 Patna, April 16: Tej Pratap Yadav, the estranged elder son of RJD chief Lalu Prasad Yadav, who has been threatening to leave the party and family over him being "overlooked" by both, celebrated his 30th birthday in the presence of his younger brother and de facto RJD chief Tejashwi Yadav. The coming together of both the brothers has added new twist to the family drama. 'I Miss Lalu Ji', Says Rabri Devi; Appeals Tej Pratap Yadav to Return Home. Tej Pratap had recently warned rebellion and said that he would name his own candidates from seats if the party rejected his candidates. But then there were reports that Tej Pratap met his ailing father Lalu Prasad Yadav, who is serving a sentence but is in a hospital as he is not well. Reports said that Lalu convinced Tej Pratap to cooperate with brother Tejashwi Yadav. Tej Pratap Takes Jibe at Brother Tejashwi, Makes Veiled Comparison with 'Duryodhan'. But on Tuesday, Tejashwi Yadav joined Tej Pratap and also shared pictures of both the brothers celebrating Tej Pratap Yadav's birthday. Disgruntled RJD leader Tej Pratap Yadav had also launched ‘Lalu Rabri Morcha’ while stating that he would contest as independent candidate from Saran Lok Sabha constituency if his mother and former Bihar Chief Minister Rabri Devi doesn’t choose to contest from there. Rabri Devi in her recent interview had also said that Tej Pratap is unhappy but will soon return to the family.